Flowering Almond that produces no almonds, Bush Cherry that produces no cherries, Mock Orange mocking what and Japanese quince are the first flowers of winter. This group of deciduous flowering shrubs is overlooked throughout the year, as their non-blooming self is quite homely, but once in full winter regalia of blossoms become Cinderella of the Garden! Why plant a Dwarf Flowering Almond that is fruitless? Why, for the unique winter beauty of course! Prunus glandulosa is a deciduous, multi-stemmed shrub that produces flower buds on bare naked branches opening up into double pink flowers followed by a red berry looking fruit. Flower buds are formed on previous year’s wood so do not prune off the branches without flowers as those will bud and bloom next spring. This shrub likes part shade in summer and grows 4-6’ tall and as wide. This heirloom plant was first recorded growing at Thomas Jefferson’s Monticello in Virginia. Another species of Prunus is also called flowering almond or flowering cherry, Prunus jacquemontii and resembles a peach or nectarine when in flower, yes they are non-fruiting cousins. The growth habit and culture is the same as flowering almond. As flower buds are being set (late autumn), if soil is dry it is necessary to water for bud development and extend the bloom period by keeping the plant hydrated, BUT ALWAYS LET THE SOIL DRY OUT IN BETWEEN WATERINGS! 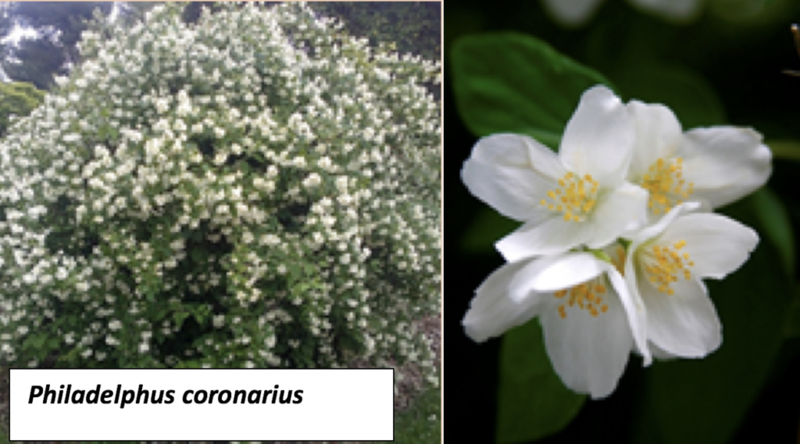 Mock Orange and English Dogwood are common names for two species; Philadelphus coronarius (non-fragrant) and Philadelphus virginalis (fragrant). English Dogwood/Mock Orange prefers part shade in the sultry south, and this old-fashion heirloom plant grows multiple upright stems from the base reaching 6-8’ tall with weeping branches cascading to 4’. When this deciduous shrub blooms the old stems are covered with single white flowers resembling a shower of flowers! P. virginalis is the fragrant English Dogwood/Mock Orange and blooms about 30 days later than P. coronarius with white stamens instead of yellow. This species is a more upright grower and doesn’t spread at the base like the P. coronarius. Leaves on both plants are rough to the touch and both species defoliate in the Fall/winter which is what makes these flowering plants so showy in the spring sporting naked branches and blooms. Proven Winners introduced the Double Take Quince Series with double flowers that resembles a camellia without any thorns or fruit, still deer resistant and drought tolerant! Double Take grows 48-60” tall by 36-48” wide; use as a specimen in the garden or as a hedge, prune and shape after flowering. Perfect time to select your Cinderella for the garden!